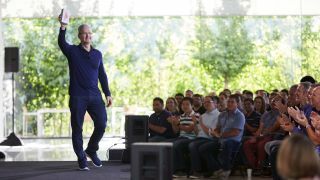 Apple CEO Tim Cook announced during an employee meeting that the company sold its 1 billionth iPhone last week, an accomplishment that was quickly shared by Apple on its website. "iPhone has become one of the most important, world-changing and successful products in history," Cook said. "iPhone is truly an essential part of our daily life and enables much of what we do throughout the day." Although iPhone sales continue to fall, the upcoming iPhone 7 could help bring Apple back from its smartphone slump. Though sales are stalling, the impact of the iPhone can't be ignored. The first iPhone launched in 2007, and it was unlike any handset we've seen up to that point. Smartphones were universally terrible then, but the iPhone's fluid and intuitive interface made the category approachable. Too bad it was an AT&T exclusive. Part iPod, part phone, part Internet device: the original 2007 iPhone. Still, there was a lot lacking from the original iPhone. While other smartphones featured 3G mobile internet speeds, the first iPhone was limited to a painfully slow 2G connection. It also didn't have any apps, with Apple instead preaching the universality of web apps, and we all know how that turned out. A year later after the launch of the first iPhone, Apple announced the opening of the App Store, which came preinstalled on the iPhone 3G. The second iPhone fixed many of the original's problems, adding 3G connectivity, GPS, and an iconic curved plastic body. The iPhone has evolved tremendously since those early days - check out our visual history if the iPhone through the ages to see what we mean - and hit numerous sales records along the way. Now, Apple is under pressure to innovate again to hopefully recapture some of that old time magic. With Apple's billionth iPhone behind it, the company is gearing up to launch the iPhone 7. A ton of rumors have circulated about what the phone will look like and what new features we'll see, as is usually the case before a new iPhone launch. What we know is that the iPhone 7 will likely look similar to the iPhone 6S, but may feature a dual camera system in the more expensive variant. There's also a good chance Apple will ditch the headphone jack, forcing users to use wireless headphones, Lightning supported headphones or an annoying adapter. The iPhone 7 is expected to be announced in September and go on sale the week of September 12. Will it be enough to help drive Apple to its 2 billionth iPhone? We'll know soon enough.